They were born almost 60 years apart, yet died within months of each other, both at the hands of the game they loved, one felled by a ball, the other by the long-term effects of not wearing a hat. Through that game, they are both forever linked to the number 63, one by virtue of his score in that final, fatal innings, the other for the number of Tests he played. 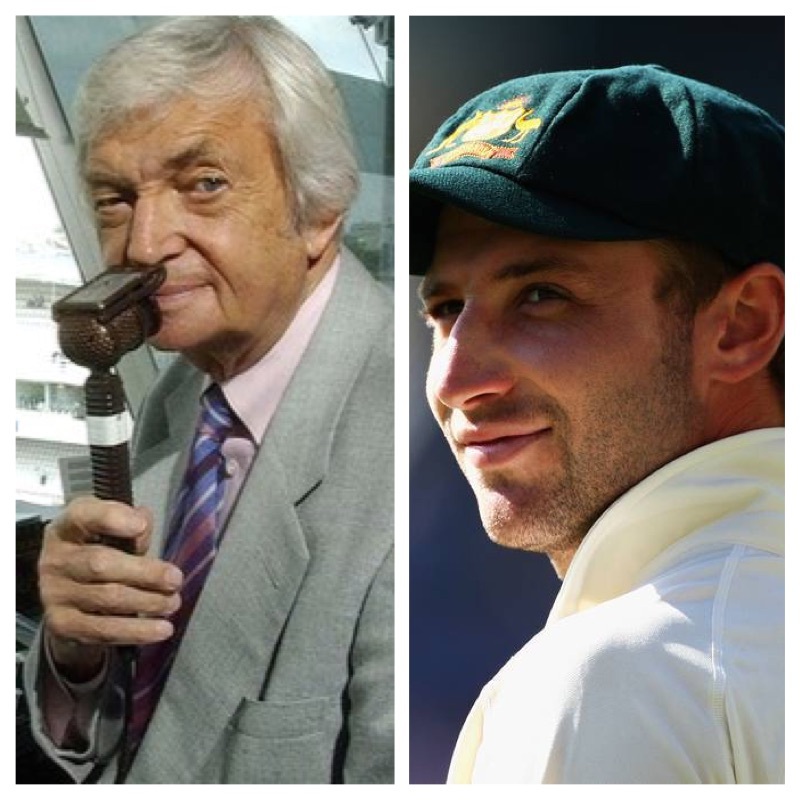 Their deaths, bookends of the Australian cricket season, have reverberated globally, one for a life and career curtailed, the other for the heights reached on and off the field. The Cricket Association of Nepal held a 63-second silence for both of them over the weekend. When the younger of the two died, well before his time, the elder paid tribute, perhaps knowing that he himself was not long for this world. He was typically succinct. Twenty-eight words were all he needed. These were some of Richie Benaud’s final public words. When people of character and calibre pass, it’s an occasion to mourn and commemorate, certainly, but it’s also a call to action, to find and be our better selves. The Australian eleven have played like men possessed this summer, grabbing every trophy on offer in honour of their fallen brother, their black armbands and glances to the heavens a constant reminder of what has driven them. It’s a remarkable achievement in itself, to fashion success from such a wrenching loss. They did indeed dig in. But for those hoping the tragic events at the SCG might translate into a kinder, gentler Australian outfit — and I confess, I was one — there has been disappointment. It was instead the Black Caps who set the standard for on-field decency this summer, much to Brad Haddin’s chagrin, who upped his sledging quota in the World Cup final to punish the Kiwis for their kindness. Fine keeper though he is, he lost me that day. So too in the commentary box which, in Richie’s absence over recent summers, has descended into cricket’s version of The Footy Show. You can almost smell the dirty socks, pizza crusts and stale farts. I’m sure they’ve got a beer snake going in there. 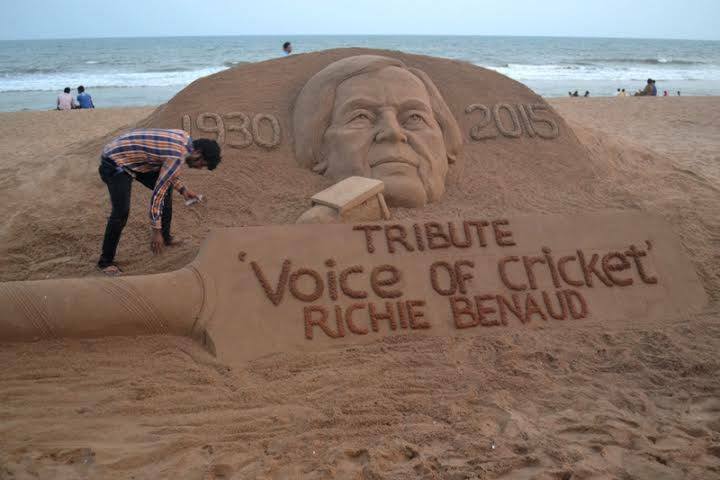 A tribute to Richie on an Indian beach. Such was Richie’s passion for the game, he milked two careers from it over more than 60 years. It gives some comfort to think they are up there together, looking down, savouring each ball bowled and each despatched, discussing the finer points of play till Hughesy’s cows come home. But it is up to those mortals remaining, those who play the game, administer and watch it, to shape it and turn it into what it will be. We are the custodians. So what do we want from this great game? Do we want it to be a forum where talent and application speaks for itself or a playground for workplace bullies? And from those who analyse the game for us from the best seats in the house, do we agree to be spoken to like mugs or do we demand a meatier discourse? Incredible insight in this article. For someone who is not a regular follower of tennis I was fully entertained by this post. Thanks for following. I’ve been learning about the Bruins from your blog – love the Grow One for the Team initiative.